While the MAD model is a useful strategy for interrelating solubility and permeability in predicting oral absorption, a more general approach to integrating solute structural characteristics into an anatomically and physiologically relevant approach for modeling absorption and disposition of xenobiotics is physiology-based pharmacokinetic (PB-PK) modeling (Bernareggi and Rowland, 1991; Grass and Sinko, 2002; Leahy, 2003; Rowland et al, 2004; Poggesi, 2004). In PB-PK models the body is described as a system of tissue compartments perfused by known blood flows and characterized by their volumes, structures and compositions. Elimination processes are described using physiologically relevant approaches as described by Rowland, et al. (1973). Disposition of the drug as a function of time is described by a series of mass balance equations, written as a system of differential equations, and the system is fitted to the available plasma and/or tissue concentrations. Historically, such PB-PK models are used on well characterized drugs or toxicants. They are rarely used on new chemical entities, probably due to the need of individual structural models for tissues (e.g. perfusion vs permeability-rate limitations) and the substantial amount of information required for their parameterization (tissue partition coefficients, tissue clearances, plasma and tissue protein binding, etc.). 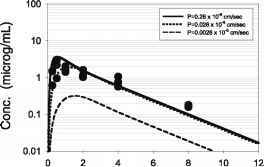 In an attempt to extend PB-PK modeling to use in a discovery setting, Poulin and Theil (2000, 2002) described a basic PB-PK model for rat, which was effective in predicting the pharmacokinetics of ethoxybenzamide, propranolol and diazepam, based on a very limited input (log P, pKa, intrinsic CL, protein binding, blood to plasma ratio). Such a model clearly has potential for simulating the outcome of the first-time-in-animal study. Partition into tissue compartments was assumed to be perfusion-rate limited. The partition coefficients (including B:P) were calculated using lipophilicity measurements (logP, logD), protein binding and the tissue composition model described by Poulin and Theil (2000, 2002). Finally, composition data were taken from the literature (Poulin and Theil, 2000; Poulin and Krishnan, 1995). Elimination was restricted to the liver and kidney compartments. 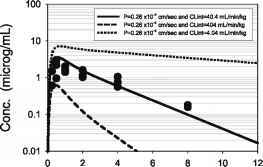 The hepatic extraction ratio EH was calculated from intrinsic clearance obtained from liver preparations and assuming the well-stirred model for hepatic clearance. Renal clearance was modeled assuming glomerular filtration only, as GFRfup, where GFR is the glomerular filtration rate and f is the fraction unbound to plasma proteins. As an example of this approach, we modeled 45 Pharmacia compounds which had been dosed intravenously to rats (Germani et al., 2004). The results of a representative example are shown in Figure 2. The input parameters were logP = 2.78, pKa = 7.3, fup = 0.065, CLint (estimated from rat hepatocytes) = 40.4 mL/min/kg. Blood:plasma ratio was estimated according to Poulin and Krishnan (1995). As can be seen from the Figure, good correspondence between predicted and observed plasma levels with time were found. This particular example represents a good prediction from the data and validates the general assumptions and interrelationships of the inputs in the model for this compound. Figure 2. Physiology based pharmacokinetic (PB-PK) model prediction for a model compound. 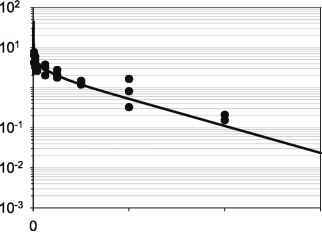 Solid line blood level-time profiles were predicted from solute parameters and rodent physiological parameters as described in the text. The data points were obtained from intravenous dosing of three animals. Figure 3. Sensitivity analysis reflecting relative influence of logP, fraction unbound in plasma (fu,p) and clearance on predicted blood level time profiles for a prototype lead candidate. Based on this analysis, decreasing logP and clearance will have greater influence on drug levels than plasma protein binding. Such analysis helps to focus optimization program on most important biopharmaceutical properties. animal in order to validate the model. If the resulting validation is reasonably successful, as in the example shown above, the PB-PK model can be used to identify those properties most important in optimizing the in vivo performance by means of a sensitivity analysis. These most sensitive parameters can then be focused on in the refinement program. 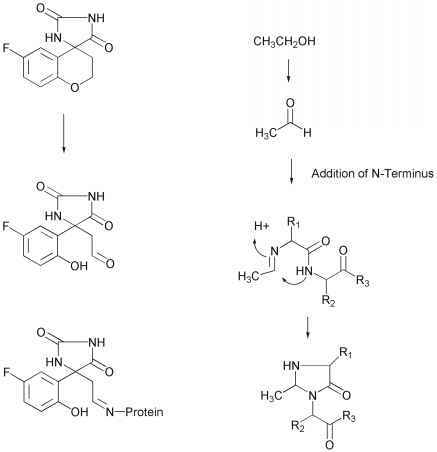 Figure 3 illustrates this approach for a potential drug candidate. Consider the lead compound to have logP = 6, f = 0.01 and CLint = 70 mL/min/kg. This combination of properties results in a fairly rapid elimination from the systemic circulation after administration. Decreasing logP to a more favorable value of 3 actually increases clearance, probably resulting from decreased tissue and/or B:P partitioning. On the other hand, decreasing clearance, while retaining the more favorable logP value, significantly increases predicted exposure. In this last example, the unbound fraction (fu,p) was also allowed to increase. Based on these considerations, the most important parameter contributing to in vivo performance is clearance, and a target value for an improved analog can be identified, helping to focus the chemistry effort (Crivori et al., 2002). An enhancement to the model to add oral absorption capability has also been explored. Sophisticated compartmentalized absorption and transit (CAT) models have been developed which allow the user to model absorption into portal blood of solutes administered as solutions or solid dosage forms (Yu et al., 1996; Yu and Amidon, 1999). In these models the intestinal tract is segmented into a series of compartments with associated physiological characteristics of the animal species of interest such as lumenal volume, surface area, pH and residence or transit time. The solute parameter inputs are aqueous solubility as a function of pH, intestinal permeability, particle size, if administered as a suspension, and dissolution rate. The model then calculates time dependent absorption as the solute moves through the sequential compartments based on these permeability/solubility-dissolution characteristics. 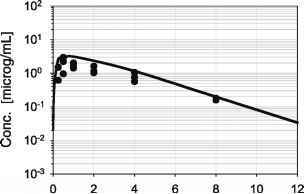 This profile can then be used as the input venous-blood concentration parameter to the basic PB-PK model. An example of this application is shown in Figure 4. In this figure, blood level time profiles are predicted and then compared to those actually observed for the model compound from Figure 2. The solute parameters used in the CAT model were solubility of 29.4 mg/ml at pH 1.8, 4.4 mg/ml at pH 4.6, 2.8 mg/ml (pH 5.7) and 0.06 mg/ml (pH 7.3). Permeability was measured in Caco-2 cells (26.0 ±6.1 x 10-6 cm/sec in Ap->Bl direction and 18.0 ± 1.0 x 10-6 cm/sec in Bl->Ap direction) scaled to the rat intestine, as described previously (Hilgers et al., 2003). These values were then used in GastroPlus™ (www.simulations-plus.com) assuming a solution dosage form. In Figure 4 is shown the predicted blood-level time profile compared to the experimental results. Again, as in the case of the intravenous model, the agreement is very good for this particular compound, capturing, in general, Cmax, Tmax and the overall clearance profile. Here also, the resulting validated model can be used to perform sensitivity analysis for parameters most important to in vivo performance. As shown in Figure 5, both permeability and clearance properties contribute to overall blood-level time profiles, with clearance having the most significant impact for this particular biopharmaceutical property profile. On the other hand, if the starting point were a more problematic combination of properties, these tools can give guidance in the direction in which to focus the optimization program and some boundary conditions on the magnitude of improvement necessary to achieve the desired end. In this regard, sensitivity analysis on fraction unbound or logP had little influence on the shape of the curves, except in the case of extreme logP values (Figure 5), suggesting these would not be profitable directions to explore synthetically. Figure 4. Comparison of predicted (solid line) and measured (symbols) blood level time profiles after oral administration of a prototype lead candidate. The oral absorption parameters were estimated from GastroPlusTM as described in the text and distribution and elimination from Figure 2. Data points were obtained from oral dosing of three animals. Figure 5. Sensitivity analysis reflecting relative influence of intestinal permeability (panel A) and clearance (panel B) on predicted blood level time profiles for model compound shown in Figure 4. While modest changes in permeability have little influence on the prediction, increasing or decreasing clearance result in significant changes in overall exposure. Such analyses allow the chemist to identify parameters most important to focus on in the optimization program.